It is A FDA approved 3.3 Gallon Black Plastic Bucket with Flat Lid 3 Pack Case and is is ideal for dry products, food, bulk retail and industrial applications. Built-in hand grips for easy carrying. This SKU No. 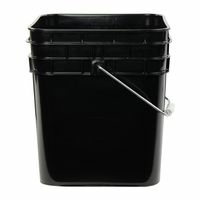 3GALSQ-3PK is a 3.3 gallon Black open head square plastic Bucket pail With Black Lid. It is made of high-density polyethylene (HDPE) plastic and includes a metal handle with plastic grip. These space-saving containers are stackable for storing and shipping and easily nest and separate when empty.